What is VISUO XS809W RC Quadcopter? It is a drone-like structure that you can use in spying over an event or geographical location. You can control it remotely from the comfort of your seat and have the aerial view of the site by using your smart phone through a WiFi connection. This RC quadcopter is ideal for surveying places from a distance. It is relatively cheap and goes for about US$45.99 in most of the online stores. Let’s go into its features. The drone has special motor arms that considerably reduce its weight. It has four motor-arms that can be folded and unfolded manually, making it highly portable. It has a wide view 2MP HD camera that enables it to focus on a large area at a time. 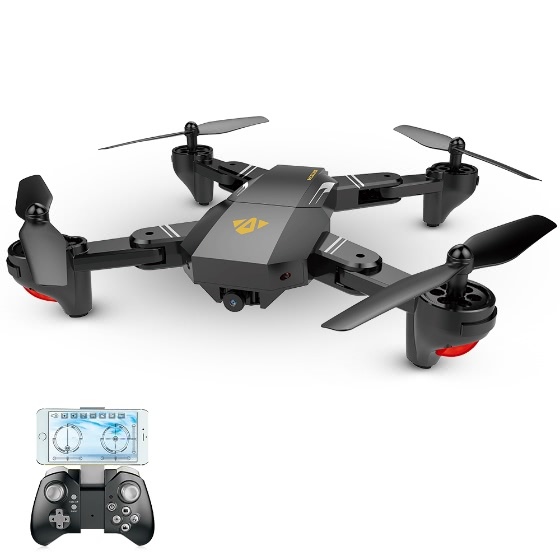 Its other luxurious ability is enhanced by the presence of WiFi connection, G-sensor mode, headless mode, 360o rotation, and a speed switch that gives you the control over the speed of the VISUO XS809W RC Quadcopter. It also has 2.4GHz radio control unit (joystick) with all the necessary buttons for controlling the flight of VISUO XS809W RC Quadcopter, from taking off to the time of landing. The brushed motor type and its plastic chassis make it light weight, a property that is desirable in aviation. As can be anticipated by now, this VISUO XS809W RC Quadcopter is one of its kind that uses lots of technology. With curiosity, one should ask this simple question. How does it achieve its highly technologized functions? This kind of quadcopter has three modes of piloting it as has been mentioned. The easiest mode is the headless mode which means controlling it using a joystick and it changes its direction depending on the direction the joystick is turned. You can remotely control the navigation of this RC Quadcopter using a smart phone when you switch to G-sensor mode. It will automatically follow the movement of your phone. VISUO XS809W RC Quadcopter has several advantages over other drones that are in the market. Its features enable it to have the following benefits. It also has headless mode makes it easy to just start off without the need to adjust the position before flying. It has four channels for descending, ascending, flying in any direction, and 360o rolling that can enable it to avoid obstacles on its path. The chassis is made of robust and resistant plastics which are lightweight and durable. It comes packed with one 3.7V 900MAH Battery which is charged for about 60-minutes, one USB cable, four propellers, user manual, transmitter, and a screwdriver. However fantastic as it may seem, it has a drawback or two. This RC quadcopter is limited n range. Its remote control can only cover a distance range of between 80-100m. Its battery also limits its flight time to just 10 minutes. Putting aside the drawbacks, VISUO XS809W RC Quadcopter remains to be one of the best in the market owing to its advanced features and abilities. You can order it from any online store. All the details concerning the purchase, shipping, and delivery can be found on our website. How to do gap year volunteering right?